The task I enjoy least as a command officer is the death notification. I've been the harbinger of this dark, terrible news to parents and spouses enough times I know how to deliver the blow: with the appropriate level of empathy, but clearly and directly. One doesn't obfuscate in situations like this. It gets worse. There is nothing more wrenching in this realm than driving a marked car with a chaplain at your side, pulling up in front of a police officer's house, taking a catatonic wife by the hand and driving her to the trauma unit where her husband lay critically injured and clinging precariously to life. Modern day paladins have a unique job. Outside the armed forces, I can't think of a vocation requiring the participant to don body armor and weaponry to protect themselves and others. Of course it's just as likely we police professionals will die behind the wheel of a cruiser than at the hands of a violent felon, statistically speaking anyway, but in the final analysis, what's it really matter? You're no less dead to your family. Progressive departments spare no expense in training to minimize our mortality rate. They can only do so much, however. Fatality accidents will always happen and human debris will continue to win the anecdotal street engagement as was so painfully demonstrated in Oakland and Pittsburgh in the last many weeks. 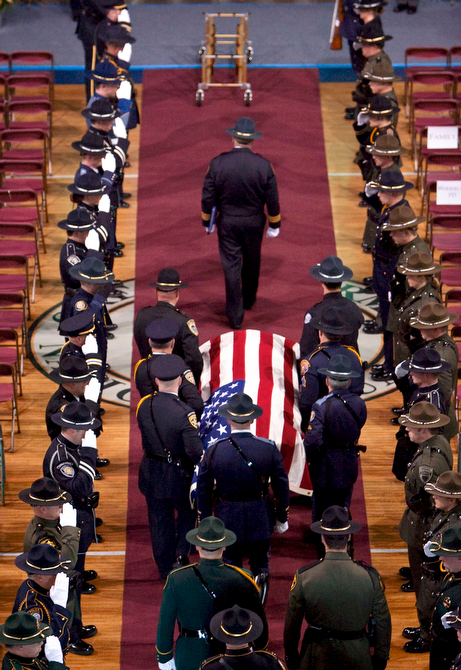 All year long, a cop dies in the line of duty someplace in the United States on the order of every 56 hours. Why not you? Why not me? It could be any one of us and at any time. Facing this reality, I pose the following question of the reader: what have you done to put your loved ones in a better position to cope with the horror of suddenly losing you? Law enforcement officers must have an "Open if" file. Family should know where it's located at in the home (preferably in a secure, fireproof document safe of some sort). The exact contents of the file may vary from individual to individual, but I'll flesh out the basic elements of what your survivors need to know. Should you perish in the line of duty, your agency should roll out the red carpet for your family and ensure nothing of importance slips by the wayside. Still, leave nothing to chance. Your list should include a close friend at work who might act as a liaison between the department and your family. You'll need contact information for the department head (e.g. chief, sheriff or superintendent), human resources director, and the elected leadership of your union or police association. If you have children from a previous marriage or relationship, direct numbers to reach them (through your ex-spouse) are to be included here. Finally, add phone numbers to attorneys and pastors if applicable. Straightforward stuff. Provide information on various bank accounts, e-mail, retirement funds, life insurance policies, and memberships of any organizations you may be a part of. A bulleted, comprehensive list of websites, account numbers, policy numbers, and website usernames and passwords should be part of your "Open if" file. Add a copy of the statement from each creditor to which you have a recurring bill to cover (e.g. mortgage, utilities, credit cards, phone, Internet, etc.). Spend some time brainstorming - don't overlook the obvious. If you're killed in the line of duty while in an apprehension scenario, it's likely your family will qualify for the Bureau of Justice Assistance Public Safety Officers' Benefits Program (PSOB). The current amount of the PSOB benefit is $315,746 for eligible deaths, a significant sum that could be the difference between financial calamity and relative calm for those left behind. The onus for filing a PSOB claim lay primarily on the decedent's agency, but your family should be aware of the BJA benefit program ahead of time. States oftentimes have some sort of death benefit for line-of-duty deaths, but these benefits aren't uniform. Some may involve a lump sum payment, tuition reimbursement at state-run universities, or health care coverage or reductions of property taxes, so it pays to investigate. The good news is, COPS (Concerns of Police Survivors) has done most of your homework for you. Access the appropriate page on the COPS website in the footer of this article. Your "Open if" file won't contain information solely on benefits and account information. Many police officers are, to one degree or another, firearms enthusiasts. If you have a gun safe at home, make note of the combination and whether you store your firearms loaded. If you don't have a safe and have a firearm or three stashed about your home, your family needs to know the exact whereabouts of the weapon(s) so it can be retrieved and made safe. If your spouse is unfamiliar or uncomfortable with guns, this task can be delegated to the family liaison officer discussed previously. If you don't have a will, get one. Obtain a medical power of attorney too. These documents are inexpensive and easy to procure through your personal attorney. You may have satisfactory results with online resources such as LegalZoom. In any case, don't leave your family ignorant of your desires if you're not there to convey them. If you have (a) explicit wishes regarding how your funeral is to be conducted, (b) specific religious practices you would like your survivors to adhere to or, (c) a fellow officer, boss or spiritual leader you want to give the eulogy, this is the place to put it that information. If you've gotten this far, you're virtually done with your work, but do take a little extra time to jot down thoughts, prayers and wishes for your family. Remind them you were doing a job you loved. Tell them you understood the risks going in. Explain the existence of the National Memorial in D.C. and the healing benefits of Police Week in May. Finally, encourage them to put the pieces back together; the best way they can honor your life is to live theirs. This article is posted at Salem the Soldier's Homepage ~ COPS Place, with the express permission of the author.